This 1973 Mercedes-Benz 280CE (W114) in icon gold gets more attention than any other car that we have driven at Love Classics. 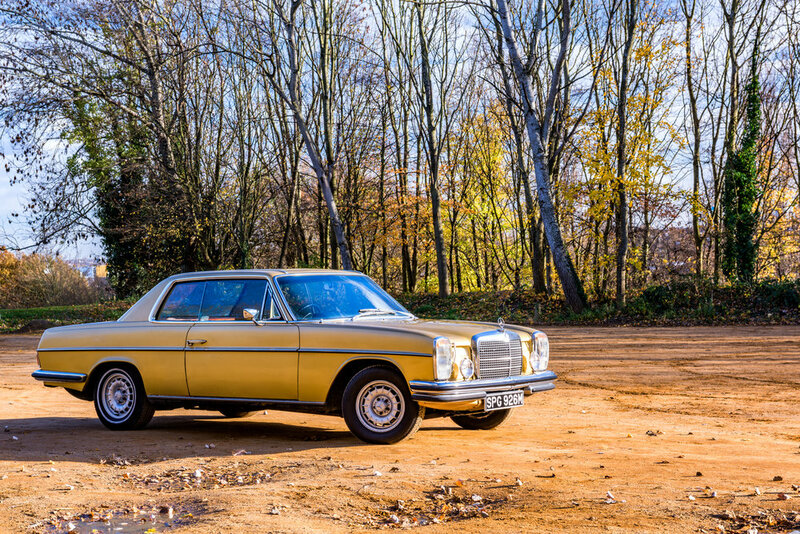 The elegantly stylish theme has so much presences on the road, it's a real head turner.As well as the regular W114 saloon model, Mercedes-Benz also continued the tradition of offering a pillarless coupe form. This car was no exception - they retained the length and wheelbase but had less passenger room, and more style. This example comes with the 185bhp twin-cam 2.8-litre engine to offer genuine performance. The car has a new genuine Mercedes-Benz black vinyl interior, electric windows, electric sunroof and modern sound system with wireless connectivity. This car makes you want to drive slow as it's such a pleasure. Solid and dependable, and increasingly cool today.